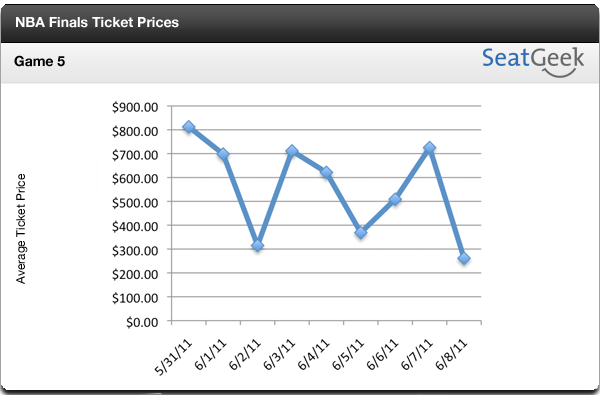 Get NBA Finals tickets here at SeatGeek.com, the best ticket search engine. Dallas managed to pull off another one of their comebacks as they have been doing throughout the playoffs. There were only two baskets made (not including foul shots) within the last 5 minutes of the game and they came from a Dirk Nowitzki lay up and a Dwyane Wade dunk which managed to put the heat down by 1 with 9 seconds left on the game clock. Jason Terry was then fouled to make 2 more foul shots putting the Mavs up by 3. The game ended when Dwyane Wade took his eye off the ball and lost control of it. He was able to quickly dish it to Mike Miller to heave up a prayer to tie the game but missed. Mavericks tied the series 2-2 and guarantee a game 6. Lebron James posted a rare single digit in the points column. The 8 points of his is his career low. He was 3-11 from the field. In the press conference after the game he was asked about his performance and what he thought of his point total. His selfless attitude continues. “If i had 8 points and won the game I’m satisfied.” Lebron has shown that he is in it to win and not in it for the stat sheet which is just the attitude teams are looking for. However, his selflessness may be a flaw in the Miami system. James is a complete and scoring is part of his repertoire. Dirk Nowitzki scored 21 points shooting 6-19. He also grabbed 11 rebounds. Good night and seemingly average for him in the playoffs but what held him back was his 102 fever. The 7 foot German set an example for the players on his team. He did his part and they did theirs. Tyson Chandler had 13 points and 16 rebounds, Jason Terry had 17 points, Kidd had 0 points but his defense was impenetrable. Through the playoffs Jason Kidd has guarded Kobe Bryant, Kevin Durant, Russell Westbrook and now 6-8, 250 lb Lebron James. He has been a big distributer and defensive force displayed in last night’s game holding Lebron to only 8 points. After a disappointing run in New Jersey, Kidd has an opportunity to come out of Dallas with a ring. The current average listing price is at $1466 and there is a possibility that this goes down as Game 5 approaches but the odds are that these tickets will sell quick as this series is proving to be a memorable one. The average listing price for game 6 has risen to $1633.